I wanted to share this card that I created with Laura's wonderful sketch 28 at 2 Sketches 4 You. I have created this card as an example for the one that I am going to be doing in a demo at my home for my Stampin' Up!® Open House that will be on Thursday June 25th. If any of you live in or will be around the Cache Valley Utah area at that time and would like to come by and create this card plus enter for some drawings for some yummy Stampin' Up!® products, EMAIL ME and I will get you out the information. Hi - first off congrats on making it through the second cut on 2sketches4u ! I know you will make it through again !! Second I soooooo wish I lived near you for the Stampin up Open house - I live in Quebec, Canada so a bit of a hike !! And Third - I love the blue bird card so wonderful !!! sooooo cute! love the little birds!! Amy this is simply sweet! LOVE it! Thanks for playing at 2S4Y! I wish I live near you, but I'm not! I hope you have a wonderful day, congrats on makeking it to the other top again, you make beautiful cards Thisone also is amazing, I loveeeeeee that bird and the text, great! I didn't know you lived in Cache Valley! We just moved from there! I would come if we were still there though! Totally darling. I love it! Such a cute card -- is the product new to SU? It's been a while since I saw a catalog -- love those birds! cute cute! 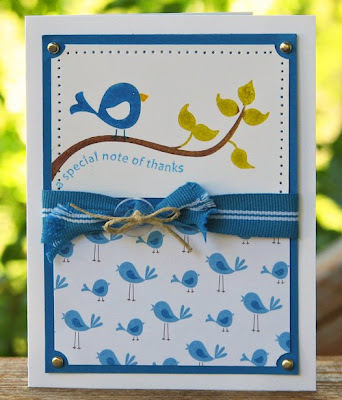 love the birdie card! and the color blue is awesome! Great job....Beautiful card! Congrats on making it to the Fab5! I just got this set - what a fun inspiring card yours is! Congratulations! !